A team of eight members of staff from the University of St Andrews Saints Sport (plus Tina the dog) have agreed to attempt the National 3 Peaks Challenge on 19th May 2018. The Challenge involves climbing the highest peaks in Scotland (Ben Nevis, 1343m), England (Scafell Pike, 978m) and Wales (Snowdon, 1085m) within 24 hours. At Saints Sport we are passionate about widening access to the University to allow the brightest students to accept their places and take advantage of all that is on offer at St Andrews. This goal is promoted by our Senior Vice-Principal and Proctor, Lorna Milne and shared across the University. Engaging in sport and physical activity is known to improve quality of life and we are passionate about widening participation across our whole community, to encourage more people to become more active. We aim to provide a welcoming environment and sporting opportunities for all ability levels and aspirations, to ensure that every student makes the most of their time at St Andrews. Our students are fantastic ambassadors for the University and dedicate many hours of their time volunteering in the local community and further afield. Now, a team from Saints Sport are stepping up to take on the National 3 Peaks Challenge - walking (and possibly running) for the University of St Andrews Wardlaw Scholarships. Any support you can give will help provide current students with crucial financial support. They will remember this forever. Every year some of the most qualified students from low-income backgrounds aspire to study at St Andrews. They work extremely hard to be accepted but many will be unable to afford a place here – unless they receive scholarship support to help cover their accommodation, meals, textbooks and other associated expenses. 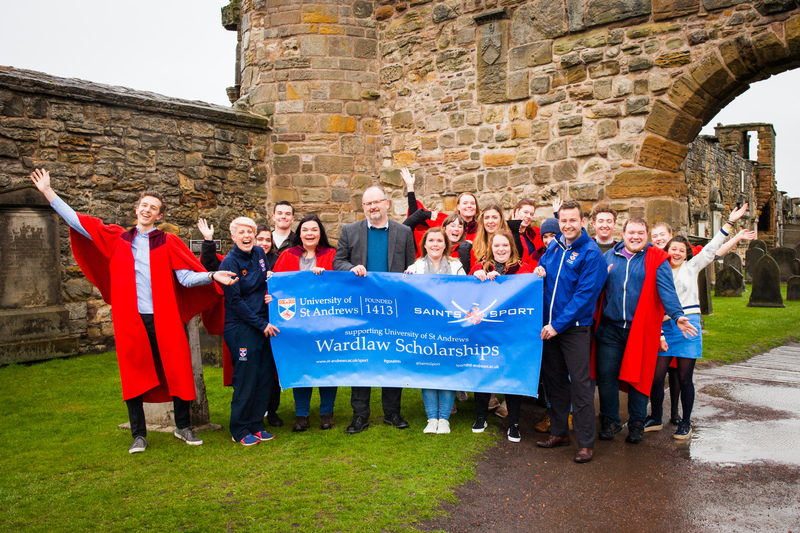 Each Wardlaw Scholarship makes £3,000 per year available to cover the basic costs of student life at St Andrews, without which a student may not be able to afford to study at our University. With your help, we are aiming to raise enough to provide scholarship support for a full undergraduate degree. The University offers so much more than just a world-class education. Our history, traditions and physical location prepare our graduates for their future careers and life beyond St Andrews, whilst providing an unforgettable student experience. o Group Thank You in Saints Sport Alumni newsletter/St Andrews in The News/In The Loop. o Any gift over £500 made before the Challenge will get a 'Shout Out' from the Peak. Gifts made post Challenge will receive a 'Shout Out' once we're all back at base camp. o All donations over £1000 given in a single gift will receive a personalised thank you postcard from the team on completion of the challenge (photo from the summit). Follow us @SaintsSport to find out how we're doing! Group Thank You in Saints Sport Alumni newsletter/St Andrews in The News/In The Loop. Any gift over £500 made before the Challenge will get a 'Shout Out' from the Peak. Gifts made post Challenge will receive a 'Shout Out' once we're all back at base camp. All donations over £1000 given in a single gift will receive a personalised thank you postcard from the team on completion of the challenge (photo from the summit).